Turkish Airlines is marking its move to a state-of-the-art home base, Istanbul Airport, by launching a fun and original safety video involving characters from the latest big-screen animated LEGO adventure. The LEGO Movie 2, from Warner Bros. is being shown in theatres worldwide beginning today. Last August, Turkish Airlines debuted the first-ever LEGO passenger safety video, which was also inspired by the LEGO® Movie franchise. The video topped the viral charts with 20 million views in just one month and then brought home the gold at the 2018 Clio Entertainment Awards. 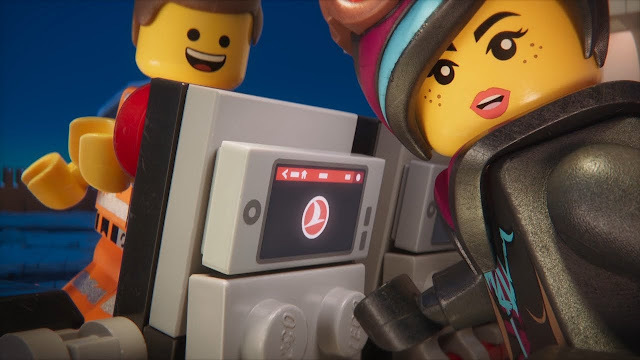 In tandem with the release of the eagerly anticipated sequel to the blockbuster The LEGO Movie, Turkish Airlines is debuting a sequel of its own – a second inflight safety video featuring LEGO characters. This will be shown on all flights starting March 1. The second video features Emmet, Lucy and others from the cast of The LEGO Movie 2 in starring roles, with LEGO Batman himself at the helm, as the director of the 4 minute 27 second film. The colorful ensemble from The LEGO Movie franchise can also be seen off screen and in the skies, on the livery of a specially wrapped Airbus A321-231, currently serving the European routes of the flag carrier airline. “With one of the youngest fleets in the world, Turkish Airlines continues to build on its peerless brand experience. We are excited to present our passengers with this new innovative safety video as we prepare to make our move to Istanbul Airport, designed from the ground-up to be an unprecedented experience by itself,” said M. İlker Aycı, Turkish Airlines’ Chairman of the Board and the Executive Committee. Production on The LEGO Movie 2 safety video took 979 hours over 4 months in five countries, Turkey, USA, UK, Canada and Australia. More than 400 people were involved in the creative process – 252 of whom were extras, in addition to the six-strong featured cast in the live-action end sequence. The live-action crew consisted of more than 80 people, while the animation team included almost 70. Established in 1933 with a fleet of five aircraft, Star Alliance member Turkish Airlines has a fleet of 333 (passenger and cargo) aircraft flying to 306 worldwide destinations as 257 international and 49 domestic, in 124 countries. More information about Turkish Airlines can be found on its official website www.turkishairlines.com or its social media accounts on Facebook, Twitter, YouTube, LinkedIn, and Instagram.